Ask the average Christian—“how is your spiritual life?”—and what you will often hear is remorse: “I know I should be doing more;” “I know I need to do better;” “At least I am doing the best I can.” Each of those statements has a sense of duty or obligation behind it. There is no delight or joy or excitement. Romans 7:1-41Or do you not know, brethren (for I speak to those who know the law), that the law has dominion over a man as long as he lives? 2For the woman who has a husband is bound by the law to her husband as long as he lives. But if the husband dies, she is released from the law of her husband. 3So then if, while her husband lives, she marries another man, she will be called an adulteress; but if her husband dies, she is free from that law, so that she is no adulteress, though she has married another man. 4Therefore, my brethren, you also have become dead to the law through the body of Christ, that you may be married to another—to Him who was raised from the dead, that we should bear fruit to God. Overall Background: We just read from Romans 7—which is probably one of the most debated and also one of the most misunderstood chapters in the whole Bible. What you believe about Romans 7 will decide how you live the rest of the Christian life. For e.g. When I started in full-time ministry, a young man who had just come out of prison asked me my opinion on Romans 7. At the time I had no clue what he was talking about. Now looking back I can see why he was looking for someone to teach him about Romans 7. 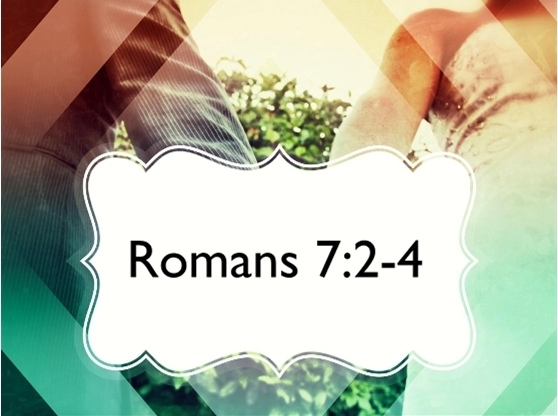 Most of our problems in the Christian life can be traced back to Romans 7. Here is where people go wrong and the rest is a mess. Here is if you have misunderstood, the rest will be a mess. You and I cannot afford to ignore this chapter. Application: Let me ask you—When you look at your Christian life, do you see it more as a duty than a delight? Do you look at it more as a list of do’s and don’ts rather than what has been done for you? Do you see your giving, your service, your singing, your soul winning as a chore? If so, then this message is for you. God wants to take you from duty to delight this morning. There are only two basic principles. Background: In chapter 6 the Holy Spirit through Paul has taught us that when we receive Christ as our Savior, not only are we forgiven for our sins but we are also set free from sin. Sin was the Old Master and we were the slaves. God’s way of helping us with our slavery to sin is not by killing the Master (which He will do one day) but by crucifying the slave. Romans 6:6tells us “knowing this, that our old man was crucified with Him, that the body of sin might be done away with, that we should no longer be slaves of sin.” As long as I am alive, I could still be put back in slavery. But if I am dead, I am no longer of any use to the Old Master. Application: Many of us have tried to fight sin by strengthening our Old Self—suppress it, fight it, deny it, train it, refocus it. I am not going to get angry; I am not going to be envious; I am not going to lust; before you know it, you are back in it. God’s way of dealing with our sin is not by strengthening the Old Self/Man. It is by removing the sinner. 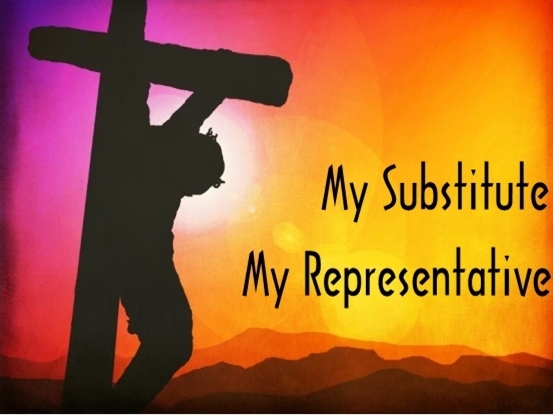 2000 years ago when Jesus died for us, He not only died as our substitute, but He also died as your Representative. As our substitute, He died for our sins but as our Representative He died to represent our death in the family of Adam. The only way we could come out of the family of sin—the family of Adam—we had to die. Jesus not only died for my sins but He also died my death for me. So you are dead to sin. Someone might say – “I don’t see it. I still see the old stuff.” If you try to find death in you, you will look and look and all you will see is sin. It’s only when you look to Christ you will see yourself dead. Galatians 2:20 20I have been crucified with Christ; it is no longer I who live, You don’t have to go crucify yourself. You simply have to receive by faith that it is done—you are dead, buried, and resurrected with Christ. Master Sin is still alive but day-by-day as I grow in Christ I see that I am “dead indeed to sin but alive to God in Christ Jesus our Lord.” I have been set free! Application: Now everything I do, I do in His strength not mine. No matter what problem or sin or habit or hang-up there is—maybe an addiction, uncontrollable temper, bitterness, envy, jealousy—come to Christ and say to Him – “I can’t do it. Sink or swim I am coming to you. You will have to do it.” At that very moment you realize that there someone else in you who is mightier than any problem or any hang-up you have. That is the only way to live the Christian life. But the moment you refuse to let Jesus have your problem, that’s the moment you begin to obey the flesh and you start on the road leading to death. Listen to Romans 6:23 For the wages of sin is death, but the gift of God is eternal life in Christ Jesus our Lord. Application: Ask the Holy Spirit of God to open the eyes of your heart and see who you are in Christ. You may not feel it; you may not understand it but you have it. Just accept it. You are no longer a slave to sin. Romans 7:1 Or do you not know, brethren (for I speak to those who know the law), that the law has dominion over a man as long as he lives? Based on Romans 6 – Our job is to remember that we died in Christ and we were buried with Him and now we walk in newness of life. We do all this by looking to Christ. Moment we take our eyes off of Christ, we start living on our own. The moment we start living on our own, we immediately place ourselves under the dominion of the Law. Stay in Christ and we are free to live. Get away from Christ and now there is a list. Stay in Christ and you will delight in serving God. Get away from Christ and it will become a chore. The only option that is left for the woman is to die herself. Listen to verse 4 Therefore, my brethren, you also have become dead to the law through the body of Christ, that you may be married to another—to Him who was raised from the dead, that we should bear fruit to God. Now the woman is married again to Mr. Christ. What happens when a woman marries? She changes her name and she takes her husband’s name and she shares in everything that he has. So also we have been joined with Christ and we take His name and we share in everything that He has. Now what is the result? Application: No longer are we trying to do things for the Lord. Now the Lord in us is bearing fruit to God. Many Christians are trying to please God, trying to keep Him happy. All that does is bring death. It is living by the Law. The Law says do this and do that. Christ says make yourself available and I will do through you. Folks-this happens all the time. People begin by abiding and slip into legalism.Let’s use that analogy of that woman we met in Romans 7:2. This comes from Manley Beasley. – She comes to church one day and the pastor is preaching the gospel. – She is convicted that she is a sinner and she is really disturbed. – She starts out by trying to get things straight. – She starts going to church more and doing things at church. – She also has some bad habits and she tries to quit. She even quits some of those bad habits…not all. – She is even giving her money to the church. – Can this save here? No. – She even begins to study the Bible and she can even learn a few things. – She tries and tries. The more she tries, the more she fails. – The Preacher preaches and lifts up Christ and the Holy Spirit opens her heart and she comes to Christ—Sink or swim—she is saved. She is one with Christ. – She goes home and turns on the TV and she does not want to watch it. Neither does she want to read those filthy novels. There is a real change in her. – She begins to read the Bible and the Spirit of the Living God begins to make the Son of God real to her from the Word of God and tears begin to flow down her face. – Her husband gets home and she is so fired up that she begins to share with him. – It is a spontaneous life and before long he is saved. – Not only that, but the children know that there is a difference. – She is living completely controlled by the Spirit. – Next to get saved was the mailman. He can see the living Christ through her. – The neighbor was an ungodly woman but somehow she is different. Jesus is working in her life. Now she has love for this woman. – She is there at church earlier than anybody else. – The preacher is preaching on tithing and she nudges her neighbor and says – “I didn’t know we were supposed to give only 10%.” I have been giving much more and God has been really meeting our needs and doing some great things. – At church they had a business meeting about some building project and they were all stressed out about how to pay for all that. – She speaks out and says that God can do anything. Very soon they had a revival. – A year later—God has used her in a mighty way. Many have been saved through her. – In a few months – she doesn’t know that anything has happened but she has to make herself read the Bible. The Christian life is no longer spontaneous. The children no longer see the difference. The neighbor is getting on her nerves again. Now she wants to slap her face off. – She even tries to win her new mail carrier about Jesus. All he says is thank you and walks off. – Now when the budget is presented she is no longer faith filled. She has become like the others. – Now she is even having a tough time with her own budget and she is not giving like she used to. – There is a revival and a preacher comes and he preaches against temper and bad habits. – This woman is convicted and she feels bad. She remembers the day when she used to be full of Jesus. She goes forward and rededicates herself and prays. – On the way out, she tells the pastor she is going to better from here. – How long does that last? Not much. She tries and tries and keeps falling. Romans 7:5-6 5For when we were in the flesh, the sinful passions which were aroused by the law were at work in our members to bear fruit to death. 6But now we have been delivered from the law, having died to what we were held by, so that we should serve in the newness of the Spirit and not in the oldness of the letter. « HOW TO BREAK BAD HABITS?